I don’t know what brought me to sleep inside Vancouver International Airport. It could be that my flight landed at 11:30pm and didn’t get out of customs until almost midnight. It could be that I didn’t want to spend money on a room after midnight. Nevertheless, I found space in the quiet confines of the International Terminal and attempted a good night’s sleep. 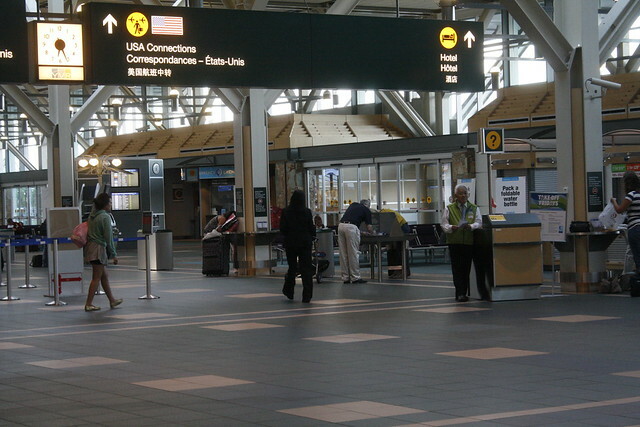 1) Make sure that airport workers don’t give a crap-At Vancouver’s airport for instance, many security guards and CBSA agents (their equivalent of Homeland Security) mill around throughout the evening and no one seemed to care whether anyone was snoring or camping in the benches. 2) If you value peace and quiet, avoid families with young children-Not that I have anything against children, but some children either cry a lot or just don’t stop talking and talking and talking and talking. 3) Use a pillow-Did you think the airport workers will give you some for free? 4) Earplugs are your best friend-Seriously. It sure beats having to listen to a cleaning machine circle around your bench at three in the morning. 5) Cover your eyes-Those lights at the airport are really, really not conducive to sleep. If you follow these instructions, I’m sure the chances of waking up cranky will lessen. That’s my advice, but I’m sure this Sleeping in Airports site will give you more tips.